A two-way contingency table in which both variables have the same categories is termed a symmetric table. In many applications, because of the social processes involved, most of the observations lie on the main diagonal and the off-diagonal counts are small. For these tables, the model of independence is implausible and interest is then focussed on the off-diagonal cells and the models of quasi-independence and quasi-symmetry. For ordinal variables, a linear-by-linear association model can be used to model the interaction structure. For sparse tables, large-sample goodness-of-fit tests are often unreliable and one should use an exact test. In this paper, we review exact tests and the computing problems involved. We propose new recursive algorithms for exact goodness-of-fit tests of quasi-independence, quasi-symmetry, linear-by-linear association and some related models. 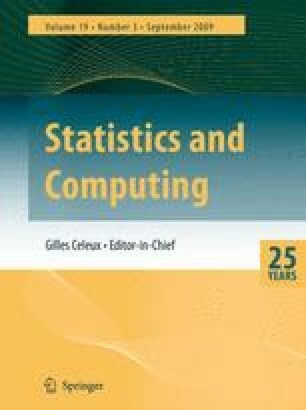 We propose that all computations be carried out using symbolic computation and rational arithmetic in order to calculate the exact p-values accurately and describe how we implemented our proposals. Two examples are presented.